Headlines: Weather conditions were very good for fishing on the weekend though it was quite cold. The fishing seems to have been good over the last week of fishing. The rivers are now closed till the October long weekend however the lakes remain open year round and will provide some outstanding Trolling, Bait and Fly Fishing. There were a few good fish caught in the rivers over the long weekend mostly on nymphs and Globugs. 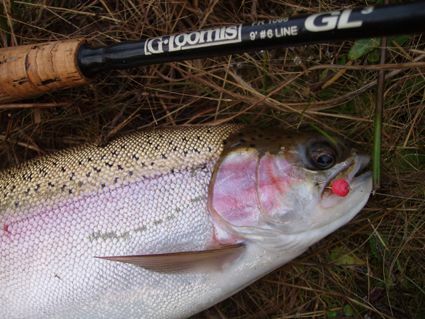 *Kieran Oshannassy managed a few nice Rainbows (pictured below) out of the Eucumbene River on the weekend. Best fish was a 1.5Kg Rainbow. All were released. There will still be numbers of these fat Rainbows in the lake at present so well worth a look too. *Steve Jackson from Bega had a great session landing eleven fish in the Eucumbene River again on Globugs. A couple of pics below. 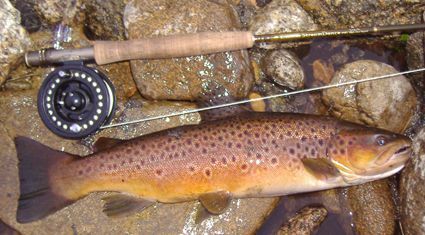 Dave Maurier from Cooma caught this nice Brown on the weekend in the Thredbo. Wet flies on dark are the best options with Craigs Nightime, Mum's Poodle, Fuzzy Wuzzy, Woolly Buggers and Lumo's being the best patterns to try. Homeleigh Bay, Rainbow Pines, Seven Gates and the River Mouth (being sure to stay away from any visible flow) are the best spots to look at. Pick areas with good weed beds and some depth. Searching out clear water is a must as wave action is stirring up some areas and making the water cloudy. Other locations would be the Dam wall and boat based working a wet fly through the trees on the Western side of the lake. Large Woolly Buggers or a Bushy's Horror or any other fly that pushes a bit of water are the go. Lake Jindabyne:- The lake has really fired over the weekend. Some great catches of Rainbows were made in the main lake after dark and most have been cracking sized fish. There have been a few more Brook Trout and Atlantics caught since the release three weeks ago. There is a good chance of picking up one of these fish in the lake at the moment. Best lures on the troll have been the Pink Tassies #55 and #72 along with #28 and Yellow wing colour schemes. *Chris Mould of Cooma along with Jamie and Harro from Canberra had a good session spinning the trees with hard body minnows on the weekend. They landed six Browns and dropped three. The biggest was 2.5kg and the others around the kilo and a bit mark. 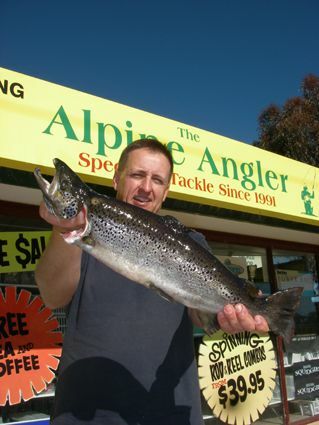 A pink Mcgrath Deep diver caught the biggest fish with Jointed Rapalas the best other lure. Spinning the Thredbo mouth from the boat is a great way to target staging Browns qth this time of year. 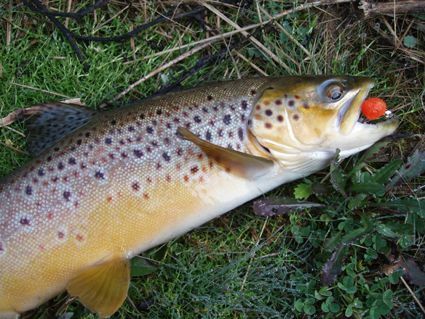 Drifting and casting soft plastics and River to Sea Tungsten Vibes is a great way to connect with some good Browns. It is important to get the lure on or very near the bottom before starting a retrieve and keep it down for as much of the retrieve as possible. Using a sounder is a good way to find the actual river bed and also fish. Rainbow Trout Squidgy fish are another great lure to use in this area either with a standard jig head or a TT Rev head which is a lead jig head with flashing blade built in. This technique is very successful and with a little time and effort can be extremely rewarding. Give it a go.